Inspired by cross-cultural life in Arrernte country of Mparntwe/Alice Springs. Includes the NT Literary Award 2012 winning sonnet ‘kwatye scours the sand’, and an early expurgated version of what would become the NT Literary Award 2017 winning poem ‘In the soft light of dawn’ which was inspired by the Rod Moss painting Anthropology: being themselves (1994). 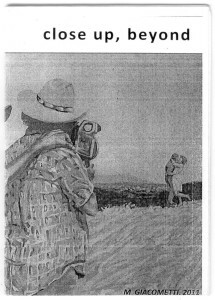 Cover image by Central Australian artist and writer Rod Moss.